The Austrian canvas uniform belt is based off the slide lock "boy scout" belt mechanism known and loved the world over. Years ago, when they were more plentiful, we sold these by the hundreds. Now, they're a little harder to find. All belts have a metallic OD finish that will wear over time revealing a brass or nickel-colored base metal. This process is shown in the three-belt comparison photo. Sizing canvas belts is very forgiving. For a good reference, measure a belt you wear and like and buy the nearest size available. Canvas belts can always be trimmed down, so when in doubt round up. Austrian Eagle belt and buckle. 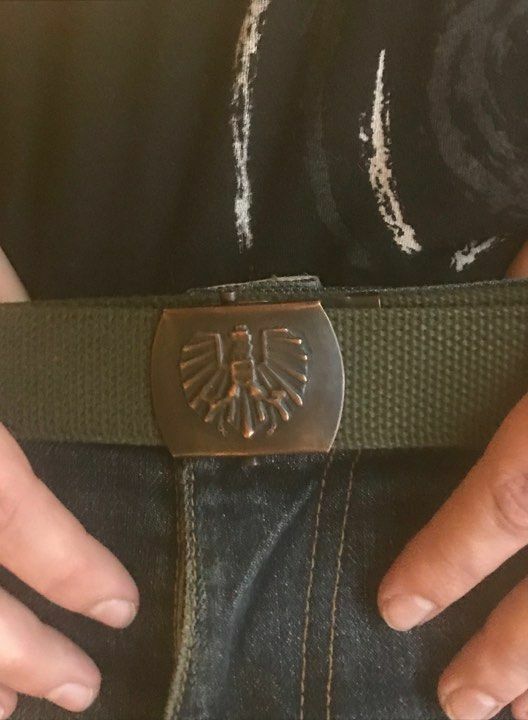 Perfect fit,perfect width,handsome buckle.The Austrian Eagle Belt/Buckle will complement your military attire,ditto your mufti attire.Two thumbs UP! with its metal slip clip to secure the belt together, this one can be a tad tricky for the first few times. BUT, between its striking metal and dark canvas belt, it's worth it. Like the belt you had scout, but better. Belt locks up nicely and will keep your pants where they need to be. Austrians know how to make good products and this belt is no exception. My recommendation, measure your waist before your order, don't go by your pants size. It's a nice belt with strong materials and the clasp is easy to use.